I’m a firm believer that leopard print is a neutral – whether you pair it with solids or prints, brights or neutrals, it always looks amazing! 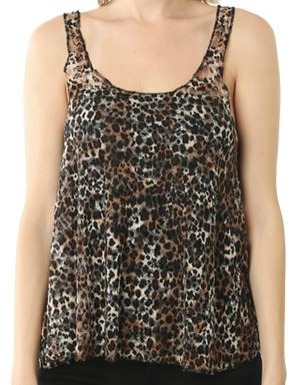 So, for this week’s Fabulous Find, I’m featuring a leopard print tank top that’s not only super-stylish, but ridiculously inexpensive. This Wet Seal tank costs less than $9 and can be worn a multitude of ways, so it’s definitely worth every penny. For a casual outfit that packs a stylish punch, pair our Fab Find with a pair of shorts in a bright peach hue. Gold gladiator sandals keep things comfy, while this statement necklace makes a bold impact. Grab a black cross-body bag and accessorize with some floral print sunglasses to complete the look. Dress up this tank by tucking it into a cream-colored skirt. Oxford flats keep this look daytime-appropriate, while this mint-and-white top-handle bag adds a super-stylish touch. Gold bangles are a glam choice, while a cobalt-hued nail polish adds a bit of edge to this feminine ensemble. Create a nighttime-worthy outfit by rocking our Fab Find with a pair of black skinny jeans. Blue heels continue the sleek and chic vibe, while jeweled statement earrings add a pop of color. Accessorize with a mirrored box clutch for interest. For the finishing touch, style your hair into loose waves. What do you think of this week’s Fabulous Find? Would you buy this tank from Wet Seal? Which look is your favorite? How would you wear leopard print during the summer? Remember to leave a comment below and tell us what you think!